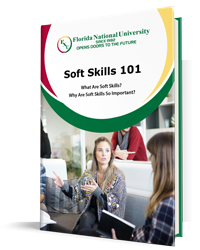 It’s no secret that studying at Florida National University assures that you’ll not only leave with a degree, but meaningful, in-field experience that can be applied in the workforce instantly. Our Income Tax Accounting students are a living testament to that. Under the leadership of Dr. Ernesto Gonzalez, our Business Department Head, these Accounting students have been participating in the Volunteer Income Tax Assistance (VITA) Program with the IRS which offers free tax return preparation to those who qualify. The program is taking place at our South Campus on Tuesday/Thursday evenings, as well as Saturday mornings. To meet the software requirements to continue the program, there had to be a minimum of 50 accepted tax returns. 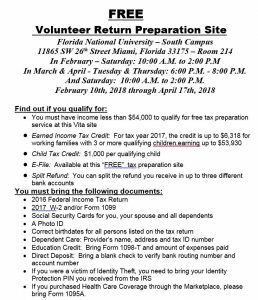 As of this writing, the FNU-South Campus IRS VITA Site is currently at 56 accepted returns with tax season still underway! Of those prepared returns, only 3 were rejected, leaving us at a 5.10% rejection rate, well below the recommended mark of 10%! Teaming up with the IRS and VITA not only allows our current students to gain real-world experience, but assists us in FNU’s never-ending mission to support our community, and in this case, the American Taxpayer.